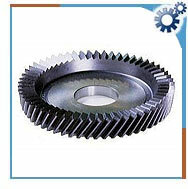 Gear cutter is a mechanical tool or machine used for the fabrication of gear wheels to cut the teeth in the wheels. These cutters are ideal for both dry machining and wet cutting processes. There are two types of spindles: cutter spindle and work spindles. Both the spindles are fixed directly to the column of the machine. The cutter spindle is hinged to create the root angle instead of installing the work spindle on a rotating base. The machine is gives maximum thermal stability. Increased torque and higher acceleration or deceleration rates are combined with shorter, faster axis motions, which reduce non-cutting time between cycles thereby increases overall productivity during machining.